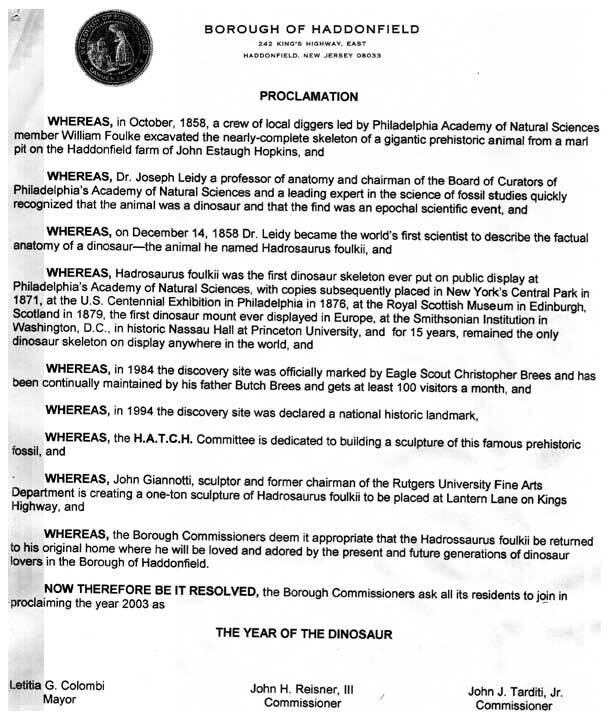 HADDONFIELD, N.J. -- In a City Hall ceremony yesterday, Mayor Tish Colombi and Commissioners John H. Reisner III and John J. Tarditi, Jr., issued a proclamation declaring 2003 the borough's "Year of the Dinosaur." 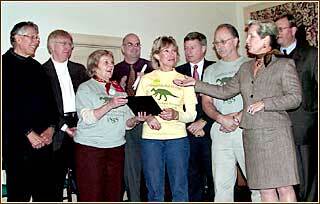 In the above photo, the Mayor presents the proclamation to Jan Twitchell (green shirt) and Beverly Aldeghi (yellow shirt), co-chairs of HATCH, Haddonfield's dinosaur sculpture committee. HATCH (Haddonfield Acts To Create Hadrosaurus foulkii) is the volunteer group that organized the $100,000 fundraising project that will install a one-ton bronze sculpture of the town's historic dinosaur in the center of the business district this October. The "Year of the Dinosaur" is a key theme of all the promotions and events planned around that fall event. Taking part in the event (above) were, left to right: Don Jackson, HATCH; Douglas B. Rauschenberger, director of the Haddonfield Library; Jan D. Twitchell, HATCH; Neal Rochford, HATCH; Bevery Lloyd-Aldeghi, HATCH; Jack Tarditi, Commissioner; Butch Brees, HATCH; Mayor Tish Colombi; and John H. Reisner, Commissioner.